The LED-54-RGBW from Adkins Professional Lighting offers superior color mixing abilities and brightness thanks to its 54x1-watt, high power RGBW LEDs. 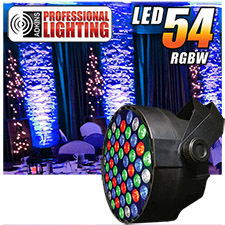 The LED-54-RGBW has the ability to run built-in programs and perform full RGBW color mixing with or without DMX control. 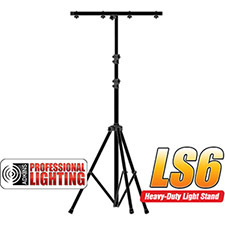 The LED-54-RGBW is perfect for up-lighting, dance floor lighting, stage lighting, architectural work and installs as well. It comes with a slew of built-in programs in DMX allowing the LED-54-RGBW to be programmed with ease. It features 4 or 8 DMX channel modes, which means it works great with any type of controller, including popular 4-channel easy controllers from ADJ or Chauvet. The super-easy to use built-in 4-button LED control panel also allows total control over the fixture including master/slave settings, sound active mode, built-in programs, auto mode, custom RGBW color mixing, and user adjustable fade/strobe effects for an incredible light show! This powerful ultra bright LED light fixture comes in a compact size that easily fits in tight places. 2 DMX channel modes: 4 channel & 8 Channel, 25 degree beam angle, Modes: Auto, Master / Slave, DMX512, Sound Active, RGBW Color Mixing, 54 1-watt LEDs (12 Red, 18 Green, 18 Blue, 6 White), AC100 - 240 volts, 60 Watt, 3.9 lbs 8" x 8" x 8.5"
4 channel & 8 Channel DMX modes. Works with most 4 channel DMX controllers and DMX 512 controllers. Built-in sound active programs that perform full RGBW color mixing and chasing for an incredible light show.